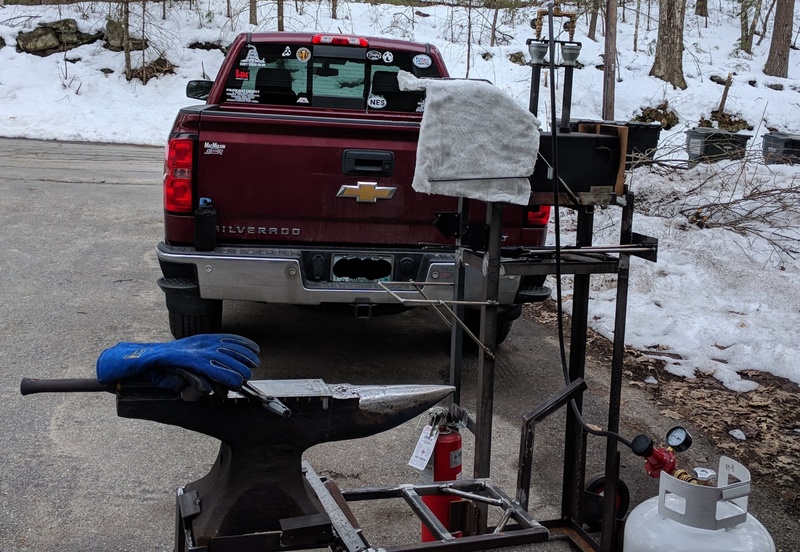 I actually got to do some forging this past Saturday (March 24, 2018) and decided to take a few pictures of how I have things setup. 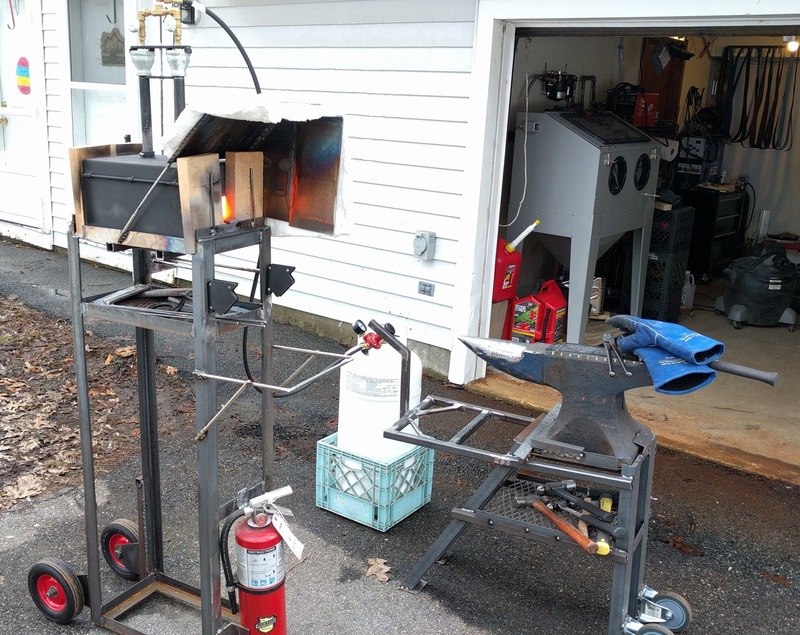 These pictures show how I set up the forge, anvil and related gear. 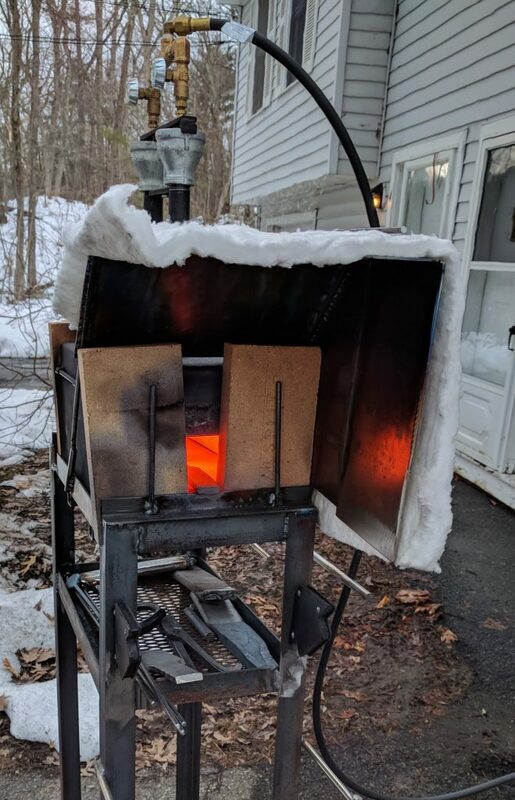 The white item draped at the front of the forge is a ceramic blanket (very high temperature tolerant) that’s over a ‘heat shield’ that I made previously. You can see the 10# fire extinguisher that I have mounted to the front of the cart (safety first). That’s mostly present for when I do the heat treatment since oil is involved (can flame up). I have additional fire extinguishers in the garage and rest of the basement (again, for safeties sake). The propane tank (sitting inside the milk crate) is a 40# unit. 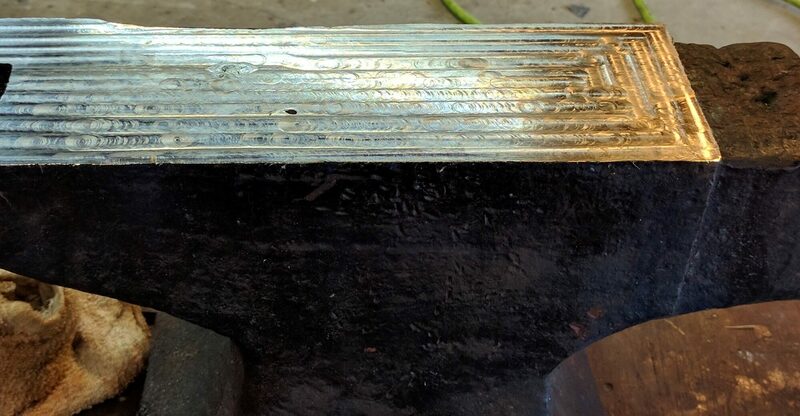 While Majestic Forge says that a 20# is good for their one, and two burner forges, I wanted to be sure I had a good amount of forging time between refills. I got the tank from the local (Pelham, NH) Tractor Supply Co, since they’re about 3 miles from where I live. Refills are done by the gallon, and JUST what the tank actually takes. You get your tank filled, they fill out a slip with how much your tank took, and you pay for that amount. Unlike other places I’ve had tanks filled, where you pay before they fill and it’s a flat rate (no matter how much your tank took). The anvil stand is a little different from the earlier pictures of it. I changed the handle on it to one that’s longer to make it easier to move out of the garage. I’m considering changing the wheels on it for larger diameter ones. Changing those will require cutting off the old ones. Plus, most likely, grinding away whatever metal is left behind. Unless I build something that mounts the wheels further outside of the rear legs (essentially ‘outrigger’ style wheel mounts). With how I have to use the forge outside (the ceiling inside the garage isn’t high enough for me to feel comfortable using the forge in there) I’m at the mercy of the weather. At some point, I’ll probably get one of the small ‘easy up’ canopies so that it won’t matter if it’s raining (or snowing) out when I want to use the forge. By ‘small’ I mean a 10’x10′ model since I don’t have a lot of area to work with here.